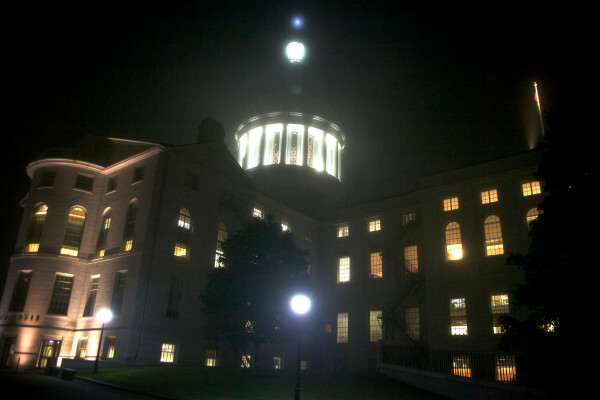 Besides killing bills, what did Maine legislators accomplish in 2016? AUGUSTA, Maine — What a difference a year makes. As the first session of the 127th Legislature neared its end in June 2015, the rancor between Republicans and Democrats — and between Gov. Paul LePage and the Legislature — was marked with ugly statements at news conferences, threats of impeachment and the spectacle of a looming government shutdown. As the 127th’s second session wound down this week, it did so with little in the way of partisan vitriol, and there were clear signs of Republicans and Democrats working together — and of LePage being involved in negotiations during the legislative process, which likely avoided some vetoes. On welfare, energy and fighting drugs, progress was made — though the 127th Legislature and its split majorities will be remembered as The Session When Most of the Bills Died. The fact that the session concluded four days before the statutory adjournment date of April 20 was a strong indication that lawmakers were resigned either to agree or agree to disagree on most bills. As is usual, many of the highest profile and most important bills were grouped toward the end of the session, which means their enactment is uncertain under LePage’s veto pen. Vetoes, along with the fact that the Legislature will wait to take final action on several bills, sets up what promises to be a marathon veto day on April 29. Earlier in the session, LePage and lawmakers agreed on several major initiatives: After much posturing, they passed legislation that pours millions of dollars into fighting drug addiction, through increased law enforcement, treatment and recovery. As part of the same deal, the Legislature funneled $15 million in new money to public schools to make up for losses caused by a statewide drop in property values. In the Senate, Republicans and Democrats have agreed much more often than their counterparts in the House. That was evident in a last-minute compromise among LePage, Republican Sen. Eric Brakey and Democratic Sen. Nate Libby on a welfare reform bill, LD 1097, which puts new restrictions on the use of cash benefits. It also was evident in a playful presentation of Senate superlatives late Friday by Democratic Sen. Bill Diamond of Windham, who named Republican Senate President Mike Thibodeau and Democratic Leader Justin Alfond the two most valuable senators. “That team helped us through not only last year at a critical time but also this year,” Diamond said. After months of wrangling, the Legislature also agreed to address recruitment and retention efforts for state police and employees at the two state-run mental hospitals by providing money for raises. The Legislature agreed to send $150 million in bond questions to voters in November: $100 million for transportation infrastructure and $50 million for research and development projects. Although LePage has been supportive of investing in roads and bridges, he has not been as friendly toward research and development spending. He is likely to veto one or both of these bond bills. The Legislature and LePage enacted a separate $150 million spending package for the Department of Corrections, most of it for the Windham Correctional Facility, though there also is money for a jail project in Washington County. That bond does not require voter approval. Presidential elections in Maine could take on a drastically new face because of an enacted bill that swaps Maine’s caucus system for a presidential primary. LePage signed that bill into law Thursday, though it can’t be implemented unless the next Legislature finds a way to fund it. Also near passage was a hotly contested bailout of the state’s six biomass electricity generation plants — two of which, in West Enfield and Jonesboro, closed this year. The bill, for which final enactment will have to wait until veto day because of technical issues in the legislative process, would provide $13.5 million to the power plants through two-year contracts that would have to be approved by the Maine Public Utilities Commission. In the fight against drug addiction, the Legislature agreed to LePage’s bid to put heavy new restrictions on the prescription of opioids and benzodiazepine-class drugs, including a requirement that prescribers check every prescription against the Controlled Substances Prescription Monitoring Program. One major issue that remains outstanding — in a way — is a bid by LePage and Republicans to raise the state’s minimum wage from $7.50 per hour to $10 per hour by 2020, in advance of a referendum on November’s ballot that would raise the wage to $12 per hour by 2020. The bill needs two-thirds majority support as an emergency measure, which it failed to garner Thursday in the Senate. The bill is tabled in the Senate, and Republicans are hopeful they can find more support and enact the bill on veto day. If that happens, it would be the most significant accomplishment of the 127th Legislature.